An exploration through a garden garnished with floral prints, a plant reminiscent of fairytale fantasies set the scene of the Hermes Spring 2016 Runway show. The transformation from ambience to printmaking patterns became a comprehensive fashion for the season. As the theme dictates, burlap tanned linen and green accents the color of a robin’s egg presented a look only a prince could be charmed with affection. A balance between baggy sportswear and tailored suits were merely boyish pieces that style mavens could wear — and in fact would love to fashion. Herme’s Collection offered recreations for such imaginations. Linen and subdued colors lit the runway with accents of summer’s beloved print: floral. Style Advice: Seasonal escapes crept upon reality in the sight of sand wood against the stain of mint green, the color of ivy leaves and oxfords the shade of black birds hiding in the trees. This color palette dictates a dazed imagery of settings, as always the case for summer: the environment determines the style of apparel. Linen is most attractive thing to fashion. Perry Ellis Linen Cotton Suit Jacket ($175) and matching Linen Cotton Suit Pant ($80) is the ideal. A brand with an impeccable approach to menswear design, Perry Ellis ranks among the brands of British wit, based in Savile Row. With repeat seasonal appeal, linen remains the suit of summer. Its cotton twill combination yields comfort in the dead heat of summer. Complete the look with a matching linen tie. An accessory from The Tie Bar, Moss Green Floral Buzz ($19) suffices. The fully-functioning e-commerce company offers affordable and fashion-forward styles that transition from classic board room attire, to the Thursday happy hour after work celebrations. 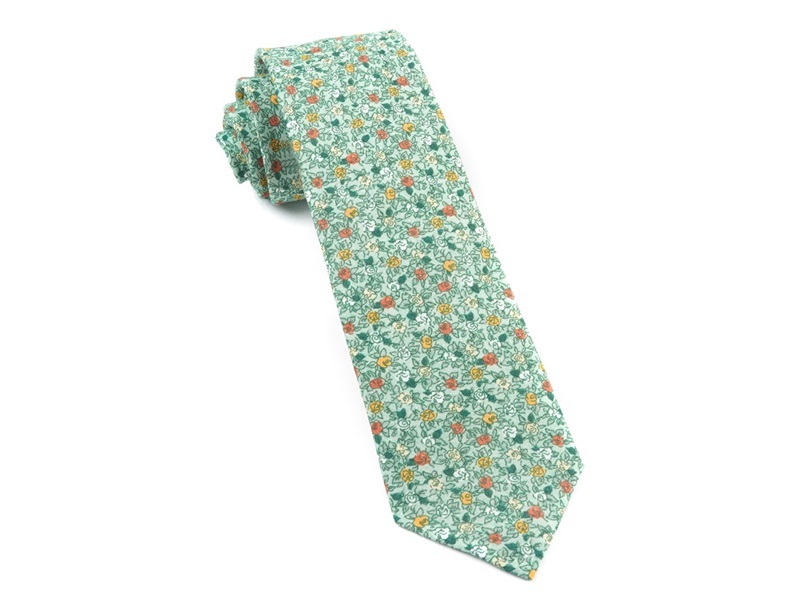 As most of the company’s prints assert, The Moss Green Floral tie is a pleasant surprise. Subtle in color, yet bold with print, the balance between the two ties the knot. A classic dress shoe stomps all yards. Burberry is the brand that beats all others for the captivating interests of a gentleman’s garb. Say it is the Standard; this is an epitome of British style, the foundation stands on footwear. Made in Italy, upper and lining all made of calf-skin leather, with rubber sole and lace-up design, the Burberry Leather Derby Shoes ($750) is with trail blaze new avenue of style. In such cases, simplicity speaks for itself. Must Haves: Indeed, this is the most desired piece. A dress shoe is precisely the investment that will advocate every formal attire event. Classic colors of black and brown will continue to match any outfit. Their neutral shades will always allow the suit and tie to dress to impress. Among the most comfortable shoes and sought out shoes — after high demand— in the fashion world right now are Italian-made Prada shoes. The Couture House’s lace-up, a style name that invents the Derby Shoe, a brogue style dress shoe, appropriates in any weather. Competition is no game for this pair: no other comfort can compare and its quality of design and fashion unreached. This brushed calf-skin leather type offers a patent leather finish most celebrated at the time of summer months. However in competitive times, one thing, appeals over style— that is, quality. This shoe gets better over time, as it wears and used for its purpose. Among the most comfortable shoes and sought out shoes — after high demand— in the fashion world right now are Italian-made Prada shoes. The fashion House’s lace-up ($720), a style name that invents the Derby Shoe, a brogue style dress shoe, appropriates in any weather. Industry Update: The Fashion Industry is honoring Andrew Bolton, the man behind the respected Metropolitan Museum of Art Fashion exhibitions. Lord & Taylor will give its gratitude to Bolton with the Fashion Oracle award, a title endowed at the Nigh of Stars Ceremony held at Cirpriani Wall Street, this fall on October 27. President of Lord & Taylor and Hudson Bay department stores, Liz Rodbell comments in a WWD report, “ As an individual whose vision and body of work exerts an overarching influence on culture and the world of fashion. Andrew Bolton is really deserving of the Lord & Taylor Fashion Oracle award.” Bolton’s NOTORITY spearheaded with the provocative and controversial “Alexander McQueen: Savage Beauty” Exhibit. The continuation of his success showed with “China: Through the Looking Glass”, a body of work recently exposed in the recent Tribeca Film Festival premiere of Andrew Rossi film, “The First Monday in May.” His recent work, “Manus x Machina: Fashion in an Age of Technology” is a testament of his success. The exhibition brought an overwhelming amount of guest response so to remain open until Labor Day weekend. In the conversation between art and fashion, another form of storytelling reveals the fashion industry.